In most cases, modern piezoelectric materials suitable for technological applications are compositionally complex solid solutions based on the endmember lead titanite, PbTiO3, with up to six different metal cations substituting on the two available sites of a perovskite-based structure. Morphotropic phase boundaries separating the distorted rhombohedral and tetragonal structures are a common feature of the phase diagrams of these materials. Now, a team from Carnegie led by Muhetaer Ahart, has recently shown that pressure can also be used to drive phase transitions through morphotropic phase boudaries in a pure compound, without the need for complex microstructures or compositions to obtain a strong piezoelectric effect. In the process, they have been able to shed some light on the general phenomenon of morphotropic phase boundaries. Using a combination of Raman spectroscopy, high-resolution x-ray diffraction and first-principles calculations, the group investigated the high-pressure structural properties of the classic ferroelectric compound lead titanate, PbTiO3, the parent material for most modern ferroelectric solid solutions. Because the tetragonal-to-rhombohedral phase transition is not allowed by symmetry, the transition must be mediated by an intermediate monoclinic phase. X-ray diffraction patterns at increasing pressures (Fig. 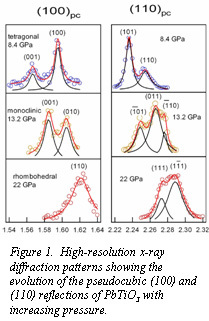 1) show the evolution of the two key pseudocubic reflections of PbTiO3 through the tetragonal-rhombohedral transition with pressure and clearly illustrate the appearance of the intermediate monoclinic phase, in agreement with first-principles calculations. This result contrasts with earlier suggestions that the monoclinic phase is really a complex twinning of the tetragonal and rhombohedral structures at the nanoscale level, which was presumed to be required for strong electromechanical coupling in ferroelectric materials. The updated P-T phase diagram for lead titanate showing approximate boundaries for all four phases is shown in Fig. 2. 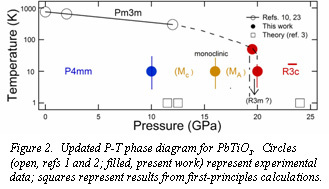 The results on pure PbTiO3 at high pressure provide strong support for a model of electromechanical coupling in more complex ferroelectric solid solutions in which the compositional variation is merely a tuning of the structural variations of the type induced by pressure in the pure endmember. Ultimately, it appears possible that pure compounds, appropriately tuned with pressure and recovered to ambient conditions, may provide the basis for advanced electromechanical materials in the future [Ahart et al., Nature, 451, 545-548 (2008)]. A new study, performed by a team including Alexander Goncharov (Carnegie) and scientists from LLNL, University of Washington, and Northwestern, suggests that material in part of the lower mantle has unusual electronic characteristics that make sound propagate more slowly, suggesting that the material there is softer than previously thought. The results call into question the traditional techniques for understanding this region of the planet. 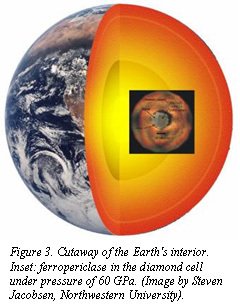 The lower mantle extends from about 400 miles to 1800 miles (660-2900 kilometers) into Earth and sits atop the outer core. Pressures and temperatures are so brutal there that materials are changed into forms that do not exist in rocks at the planets surface and must be studied under carefully controlled conditions in the laboratory. The pressures range from 230,000 times the atmospheric pressure at sea level (23 GPa), to 1.35 million times sea-level pressure (135 GPa). And the heat is equally extremefrom about 2,800 to 6,700 degrees Fahrenheit (1800K4000K). Scientists from HPSync, Carnegie, Argonne, the Russian Academy of Science, and Krasnoyarsk State University, led by Yang Ding (HPSync) have discovered that the magnetic strength of magnetite declines drastically when put under pressure. They have found that when magnetite is subjected to pressures between 120,000 and 160,000 times atmospheric pressure its magnetic strength declines by half. They discovered that the change is due to what is called electron spin pairing. Magnetism comes from unpaired electrons in magnetic materials. The strength of a magnet is a result of the spin of unpaired electrons and how the spins of different electrons are aligned with one another. This research showed that the drop in magnetism was due to a decrease in the number of unpaired electrons. 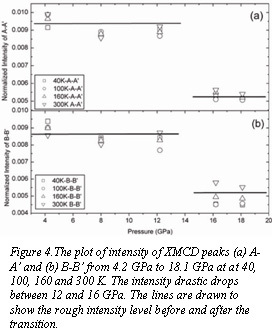 To study the mineral, the researchers developed and applied a novel technique, called X-ray Magnetic Circular Dichroism (XMCD) at the APS. The technique uses high-brilliance circularly polarized x-rays to probe the magnetic state of magnetite as a diamond anvil cell subjects a sample to many hundreds of thousands of atmospheres. The researchers combined their experimental results with theoretical calculations by collaborators to pinpoint why the magnetic strength changes. The study reveals the electron-spin configuration in the iron sites of the mineral to be the origin of the phenomenon. This discovery not only shows the profound effects of pressure on magnetism, it also discloses, for the first time, that pressure induced a spin pairing transition in magnetite that results in changes in the electron mobility and structure. The results of this study will appear shortly in Physics Review Letters this month. For coverage around the world, see scienceticker.info and Der Spiegel.